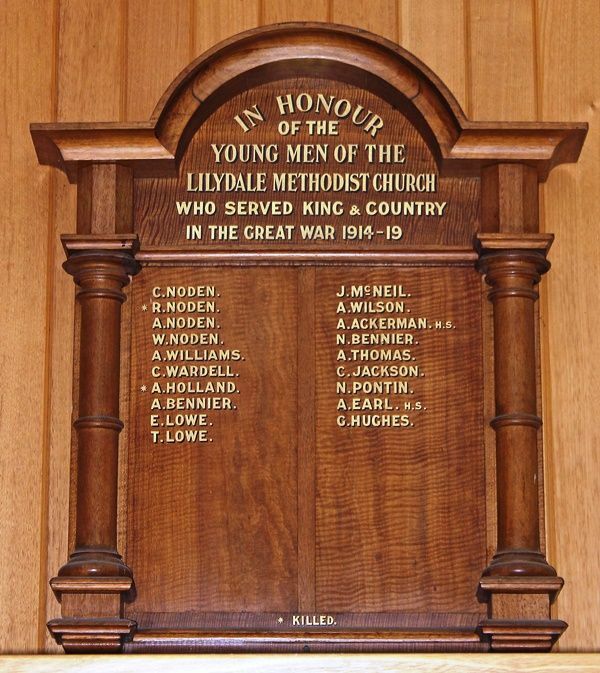 A wooden honour roll commemorates those connected with the Lilydale Methodist Church who served in World War One. Anniversary services were held at thie Lilydale Methodist Church on Sunday last at II a.m., 3 p.m., and 7 p.m. The Rev. E. Tonkin. of Frankston was the preacher. At the afternoon service an honor roll was unveiled by the Rev. Tonkin and Mr. Jas. Rouget. M.L.A., in the presence ot a large number of people. The members of the shire council had been invited to attend. and Crs. H. Hughes (president). J. M'Ghee, J. Wallace, and W. G. Town were present. Ringwood and Croydon Chronicle (Vic), 7 September 1917. Note : The Lilydale Uniting Church was sold in 2014 to Melba Support Services who plan to retain the church for use by parishioners.